One; Screw Eye 5/16" diameter with the screw portion between 7/8" and 1" long. Scrap of Wood for drilling over. Prepare your drilling area by laying a scrap piece of wood down that the drill will be able to hit. Use the hand clamp to hold each square piece of wood or to clamp the thin pieces of wood onto your scrap of wood. Drill straight holes through the center of all the thin circular and rectangular pieces. Paint your thin pieces according to the type of vegetables you want them to be. Paint the wood squares light brown for chicken or medium brown for beef. Varnish all the food pieces and let dry. In one of the square blocks of wood, screw the large screw into the block so that the screw's end will come out on the other side of the block as much in the center as possible and as straight as possible. Screw completely through the wood so that the pointy end of the screw is sticking out of the wood square. To assemble the kabob, open the metal hanger by unwinding the ends just below the hanger hook. Start assembly by sliding the square wood block that has the screw point sticking out of it onto the metal hanger. Continue adding your vegetable and meat pieces alternately as you wish. Finish by sliding the square wood block that has the screw eye sticking out of it, onto the metal hanger. Trim off any excess wire on the end. Cut a piece of the wood doweling that is the same length as the kabob. Adjust or rotate the wood food pieces if necessary. Use your pliers to additionally bend the hook of the hanger to make it more of a secure loop. 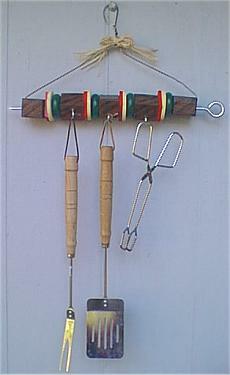 Fun and Unique way to hang your Barbecue Utensils and tools!